The large sandy areas in some cities such as Hoai Nhon, Phu My, Phu Cat and Quy Nhon in Binh Dinh and Song Cau, Tuy An, Tuy Hoa, and Dong Hoa in Phu Yen are well suited for green power projects like solar and wind. Binh Dinh is one of the top three provinces in terms of solar power potential. According to the chairman of the Binh Dinh people’s committee, in the last few years the province has been focusing on developing green energy to foster the environment and spur tourism and other economic activities. With many billion-dong projects, Binh Dinh has been turning many arid areas into solar power hubs, thus also speeding up urbanization. Today we see an economic zone in sandy Nhon Hoi. Tomorrow it will become the hub of industry, services and tourism of not only Binh Dinh but also the Central Region. 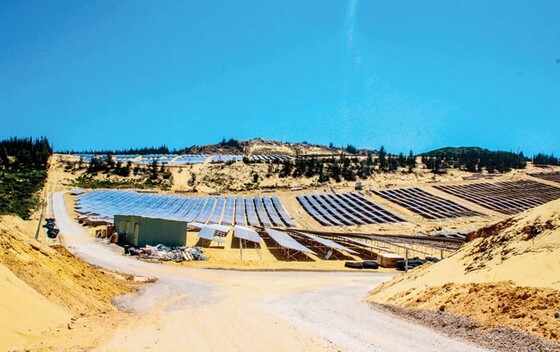 In the hot sandy area of Phuong Mai in the Nhon Hoi Economic Zone, you will see a huge solar power farm built by Fujiwara at a cost of VND 1.4 trillion (US$60.3 million). The solar panels stretch over dozens of hectares. Osamu Kimura, CEO of Fujiwara, said 4,000 out of 5,048 solar panels have been assembled. The plant is set to be completed in May and begin commercial operation in June. It is expected to produce 74mn kWh per year. The number of solar power projects proposed in Binh Dinh has seen a spurt after Decision 11/2017/QD-TTg, dated April 2017, was issued with many incentives to encourage the development of green power, especially solar power. Many investors are working hard to complete their plants soon to get the incentives. The deadline is June 2019. Many others are in the process of carrying out studies before investing. Tran Chau, deputy chairman of the Binh Dinh people’s committee, said many investors from Korea, Japan, India, France have been coming to explore opportunities to invest in solar power. Binh Dinh currently has 22 renewable energy projects with a total capacity of 1,220.5 MW, 18 of them solar plants, three of which are under construction. Phu Yen has designated 14 areas with 5,160ha for renewable energy projects with an estimated capacity of 3,541 MW. So far nine solar power and wind power projects have been approved, and six are under construction at a cost of VND10 trillion ($431 million).